Don’t say I didn’t warn you. Don’t say that you for a moment believed that I wouldn’t occasionally sneak in a Cat Blog. I solemnly pledge that I will at least pace myself. Can we agree on no more than one Cat Blog…a week? A month? I shall do my best. Wait! I was listening to Hits of the 70s as I wrote, and suddenly Al Green was in my living room crooning “Let’s Stay Together.” I had to take a quick break to dance around the living room. I feel like I busted a few moves, but may have simply bust a lamp or stomped on a cat. Oh yeah, cats. I knew we were headed somewhere. Tonight I bring you the life and times of Mrs. Helen Roper. At 3, she is the old lady of the bunch. She does not abide kitten shenanigans well, and one firm paw on a kitten’s head should send the message, but they just keep coming back for more. 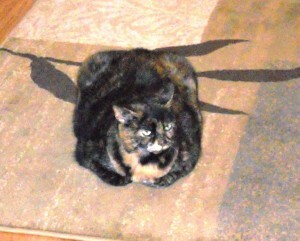 Helen is what you might call “big boned.” It’s not her fault; she got it from my side of the family. 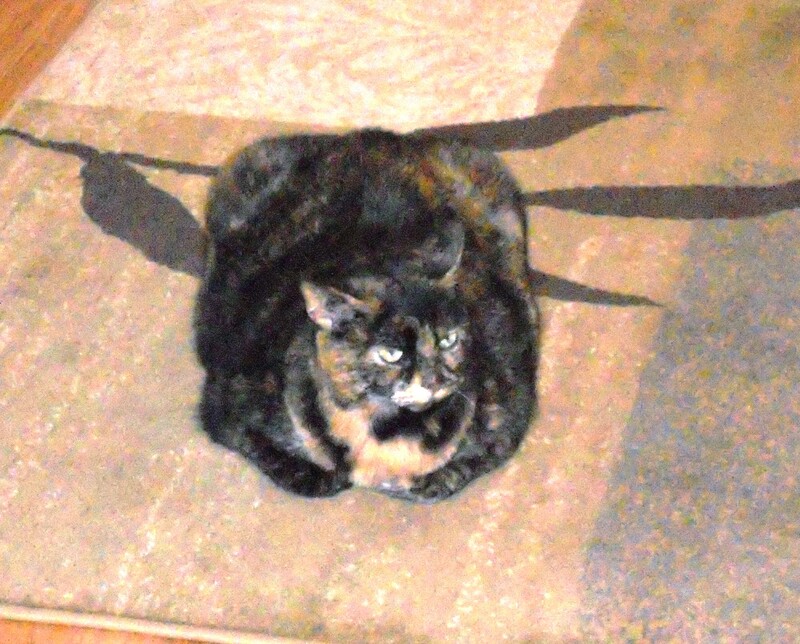 The Yiddish word for “big boned” is zaftig. At 14 pounds, Helen’s just a tad zaftig. Her tortoise shell fur is perfect because Helen stays in one place for a long time, and when she gets up for food or bathroom breaks she moves pretty slowly. Helen also struggles with a licker problem, but I don’t think AA can help. Helen loves loves loves to lick hands, feet, legs, other cats, etc. She rarely sits on my lap, but she enjoys settling down with Dan and licking his arm raw. Helen is a serious sort of cat. She’s contemplative, often just staring at a blank wall for quite some time. I can only assume she is doing Sudoku in her head to pass the time. Is that all there is to Helen? Certainly not, but I promised I would pace myself. This entry was posted in Uncategorized and tagged Animals, Imagination, Television. Bookmark the permalink. Justin thinks it is so cute that she licks people.